The course of Delhi’s history is much like Kathak, one of India’s oldest classical dance forms that trace its origins to 500-400 BC surviving and thriving as oral tradition passing from one generation to another verbally and through practice. Unlike most other dance forms, it constantly reinvented itself with changing times absorbing central Asia influences in style, form and attire after the advent of the Mughals. While it incorporates gestures and facial expressions conveying the ras (soul) and bhava (mood) just like Indian classical forms but unlikely emphasises rhythmic foot movements adorned with small bells, Ghungroo. Delhi, the doorway to India has a past as glorious, varied, colourful as the nation it represents. The season, embark with the Yamuna, the meandering river that has forever patronised the city on a journey that is filled with enchanting tales of power, conquest, revenge, devotion and love that swells like the Solway and ebbs like a tide. 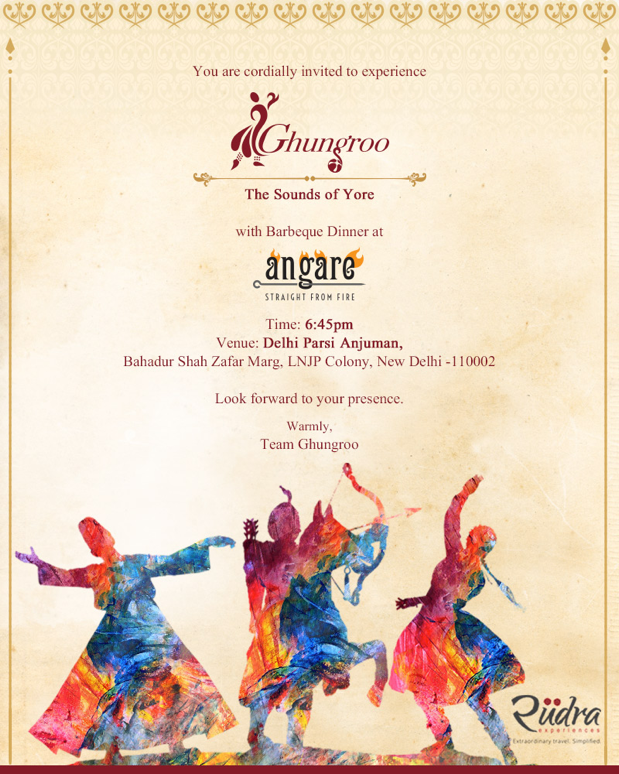 In Ghungroo, Delhi’s first dinner theatre you get to enjoy an extraordinary saga of romance with the bygone era, a Kathak dance musical narrative followed by an authentic India barbeque at Angare- straight from the fire. The food is delectable in outdoor setting and is reminiscent of old Delhi.